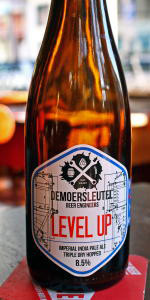 I had a 0.375l bottle of this at Café DeRat in Utrecht on 23SEP17, at a cost of €7.00. It had a striking, rich, orange marmalade color, with some slight haze. Had a frothy, rocky, off-white head which shrank slowly, with lovely lacing. The aroma was, oddly, mild, considering it had 80 IBUs. There was some piney, citrus notes detected. The body was about medium, but it was quite prickly and airy on the tongue. Taste had some light toasty, biscuit malt with some subtle caramel. Also possessed a bit of tangerine, peach and apricot before getting rindy, pithy and resiny. Also had some grapefruit and bitter orange peel, and stayed bitter to the end. Not bad at all.... Prosit!